Today I am happy to present a guest review from a long-time reader and fan of the Unam Sanctam Catholicam blog, Chris Owens. Chris is a student at the Pontifical University of St. Thomas Aquinas (“the Angelicum”) in Rome, where he is a candidate for the S.T.L. in Thomistic theology. He is also a co-director for the St. Albert the Great Center for Scholastic Studies, “an organization dedicated to the revival of higher studies in theology undertaken according to the mind and method of the great scholastics”, which we have often promoted here on USC. Chris recently submitted a review of the new book Resurgent in the Midst of Crisis by Dr. Peter Kwasniewski, who many of you will recognize as a contributor to many traditional Catholic blogs, including Rorate Caeli and New Liturgical Movement. Dr. Kwasniewski is also a well-known professor of theology and philosophy and a director and composer of sacred music at various Catholuc institutions. I myself have had some personal encounters with Dr. Kwasniewski and his family over the years and can honestly say he is one of the more well-rounded voices out there in the traditional Catholic world. "As a husband and father, Kwasniewski offers to his reader the rich liturgical experience which he and his family have obtained through living abroad for many years, and his intimate relationship with not only the Roman Rite, but also the various Eastern Rites, as well. With fatherly solicitude, he observes the pitfalls that he wants his children to avoid, and offers this as an admonition to us all. This unique perspective is worth the reader’s pause, for it is not merely that of an Americo-centric, sanitized experience of the Faith, but rather he presents to the reader a truly “catholic” perspective on his subject, one which is nourished by those great treasures of Christendom, of Counter-Reformation art and 3architecture produced ad Maiorem Dei Gloriam, embracing all of those spiritual and sacramental aids which formed so many great Saints in our history. In the midst of a far-reaching “crisis”, one that has resulted in the loss of faith for so many, Kwasniewski observes that there has been a “resurgence” - a second wave, as it were - of the Church Militant, nourished by the graces of the rich sacramental life found in the tradition washing over them. This aspect of the book speaks to the sweetness of the truth, goodness, and beauty which is found in the rites we have received from the tradition. With a keen insight, Kwasniewski does not fail in his effort to impress upon the reader the necessity of this patrimony if one is to persevere in the spiritual life." I encourage you to read the rest of this excellent review, which Chris Owens prepared just for USC. The rest of the review is available on the Unam Sanctam Catholicam website. 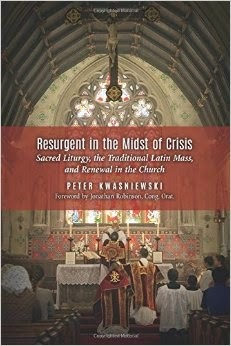 Click here to read Chris Owens' review of Peter Kwasniewksi's Resurgent in the Midst of Crisis. If you want to purchase the book, it is available on Amazon (click here for product page). I have had the St. Conleth page linked on the sidebar for many years. I will link up a few of your others, though.